View affordable two bedroom cabin rentals in Pigeon Forge TN or along the foothills of the Smoky Mountains in scenic Wears Valley! Our two bedroom cabin rentals in Pigeon Forge are great for honeymoons, romantic getaways, and small families who wish to remain close to the non-stop action of Pigeon Forge. We offer affordable cabin accommodations throughout Gatlinburg, Pigeon Forge, Sevierville, and Wears Valley. No matter where you stay in the Smokies, your two bedroom cabin gives you easy access to dozens of live dinner shows, exciting attractions, and local restaurants. Our two bedroom cabins feature plenty of amenities that offer romantic ambiance for your honeymoon, anniversary trip, or weekend getaway with someone special. From relaxing hot tubs and in-room jacuzzis to inviting fireplaces on chilly winter nights, these cabins set the stage for romance and relaxation. Looking for a romantic, secluded honeymoon cabin in the Smokies? Many couples adore the scenic drive into Wears Valley as they're guided by the majestic Smoky Mountains overlooking the valley to their quaint cabin retreat. From your honeymoon cabin in Wears Valley, you can hear nature awake with the songs of chirping birds as the sun rises over the mountains and early morning mist lifts off the valley floor. In the evenings, the setting sun casts a spectacular golden glow over Wears Valley, which you can observe from your cabin's deck. When it's finally time to turn in for the night, curl up in a comfortable queen or king-sized bed and enjoy some much needed rest in your mountain cabin. 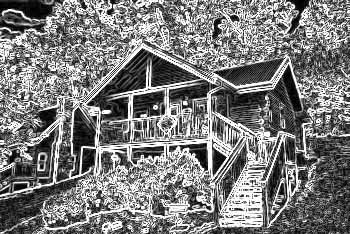 A two bedroom cabin rental in either action-filled Pigeon Forge or slower-paced, scenic Wears Valley offers an affordable cabin rental sure to meet any honeymoon, anniversary, or small family getaway. Some of our 1 bedroom cabins in Pigeon Forge, Wears Valley, and Sevierville sleep the same number of guest as our 2 bedroom cabins, giving you even more cost savings. Speaking of, did you know that you receive a 15% discount when you book a cabin online with Cabins USA? Start saving on your memorable Smoky Mountain vacation today!